I was asked if I could fix some chairs. The customer wanted the remaining arms(one was missing from each) removed. 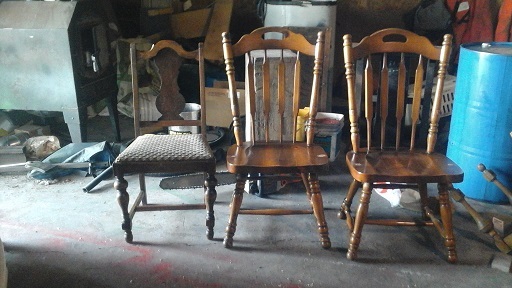 The old chair on the far left had belonged to the customer's grandmother and she was missing 3 pieces, as you can see in the picture below. As usual, I forgot to get a before picture of the two on the right, this, of course is after I had removed the arms. I filled the holes, stained the filler and put poly on top of that. The holes are a little lighter than I would like, but the customer was interested mostly in function and did not want the chairs sanded and restained. Grandma was a little bit more difficult. I sacrificed a couple of old(and ugly) chairs for parts to fix her. 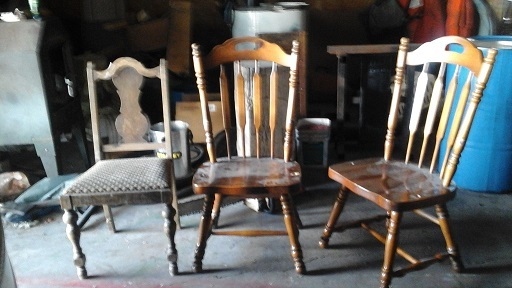 The chairs were given to me, and they are probably about the same age, although not the same type of wood. They are oak, always remember, oak is HARD, lol. 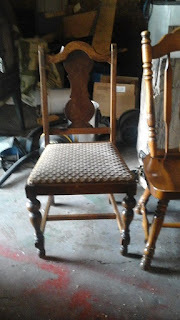 I was able to use the pegs and the three stretchers from those oak chairs. 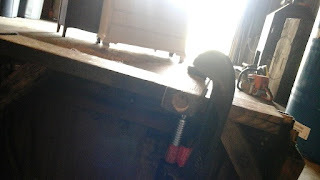 I had to cut off the old pegs and drill new holes for pegs from different parts of the old oak chairs, because the holes for Grandma's stretchers were much smaller. I pegged and glued the stretchers in place. I also took the old metal feet off of the bottom of the old chairs and added them to her, since she had some originally and they were gone. 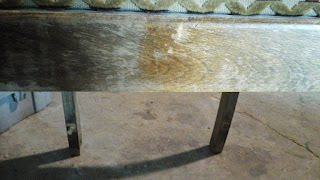 Then, her old dry wood was treated with some Howard's Wax and Feed. 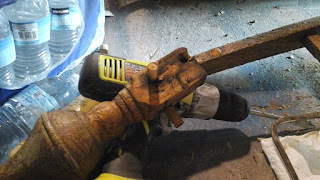 It really does a great job on old dry wood, without changing the character. Grandma is stylin' now - thanks for the tips. I swear by Howard's. Thanks Donna, it's the best stuff, that and Old English scratch cover are amazing products! Thanks Tammy! The owner was very hesitant to have me do anything to the finish on her. I explained that it really wouldn't be like refinishing it, which he was dead set against. She was so dry and I think he now understands that it will be the best thing for the wood.